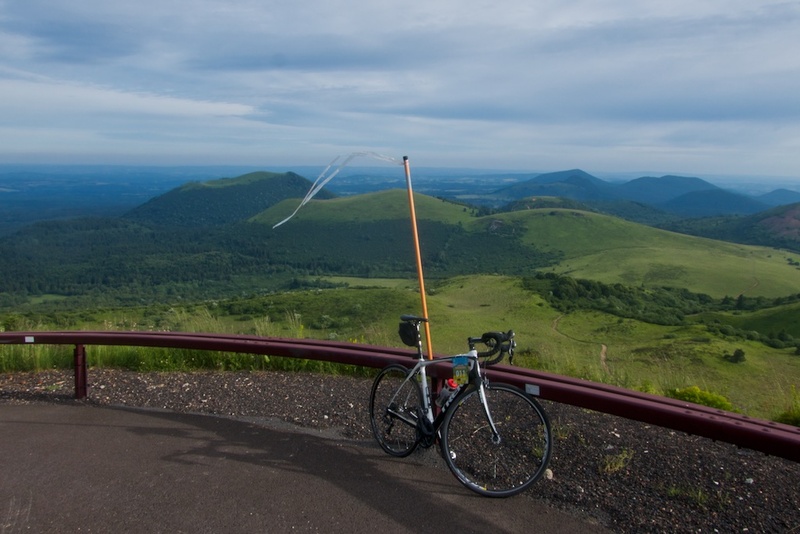 On Sunday, I cycled up the legendary dormant volcano Puy de Dôme, the most famous cycling climb in the Massif Central. Woohoo! 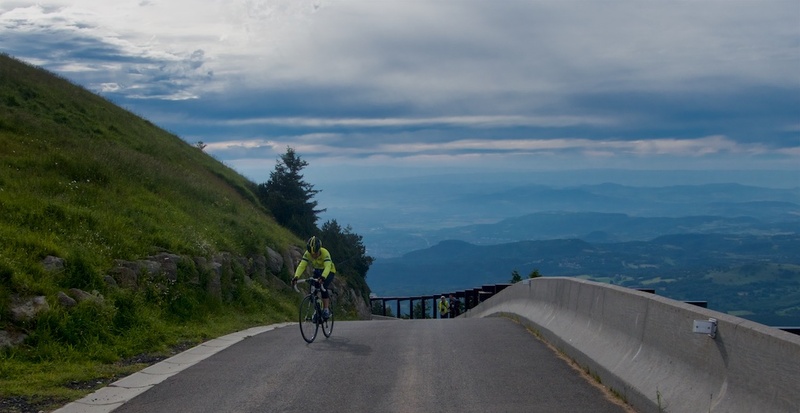 For a LONG time, cyclists have had very limited access to this climb. Last decade it was a couple of hours every Wednesday morning. 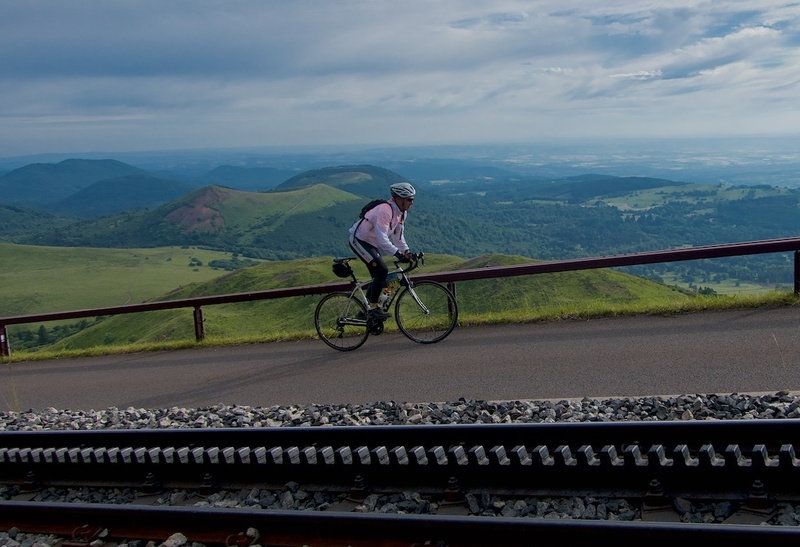 Then in 2012, they opened a train that takes up half the road on the final 4.8 kilometres and cyclists were permanently banned, except for ONE day a year. That one day was Sunday! 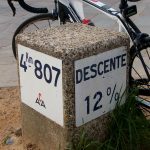 The event was limited to 300 cyclists. I was so excited when I initially heard of this a few months ago, that within 12 minutes of reading about it I had printed and filled out the old-fashioned application, written a cheque, and posted the application. Net, I was #11 of the 300. 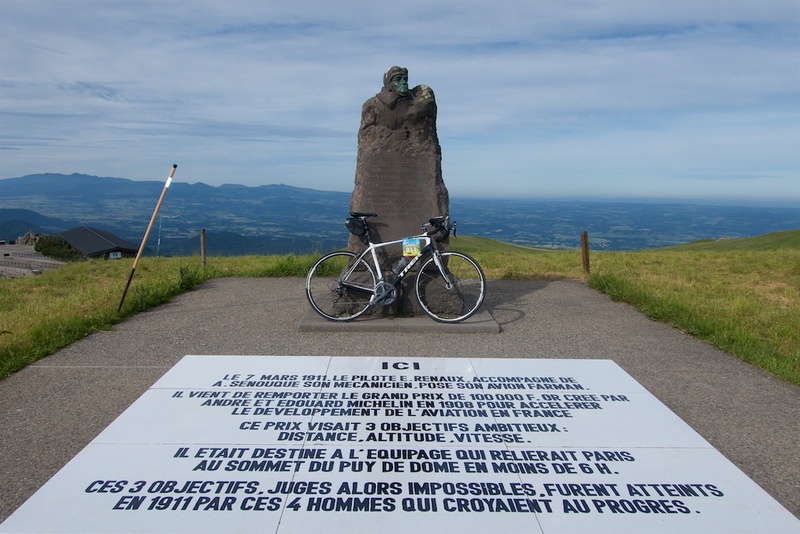 Puy de Dôme has appeared 13 times in the Tour de France between 1952 (Coppi!) and 1988. 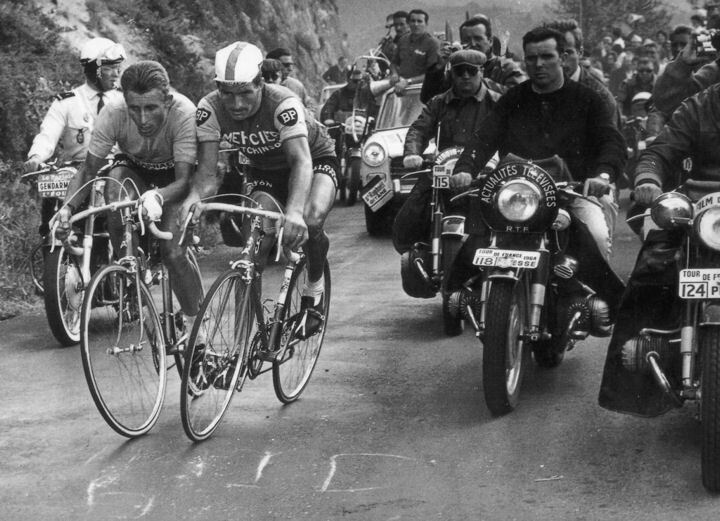 This is where Merckx was punched (1975), and where Poulidor and Anquetil had their classic battle leaning on each other (1964). The event started in the village of Orcines, but the evening before, far lower down in Clermont-Ferrand, I had this incredible view. So I decided to start from the city-centre and cycle up to the event start. It’s only the final 4.8 kilometres that are usually closed. Here the road passes through a check-point and gets consistently steep. There are no hairpins. 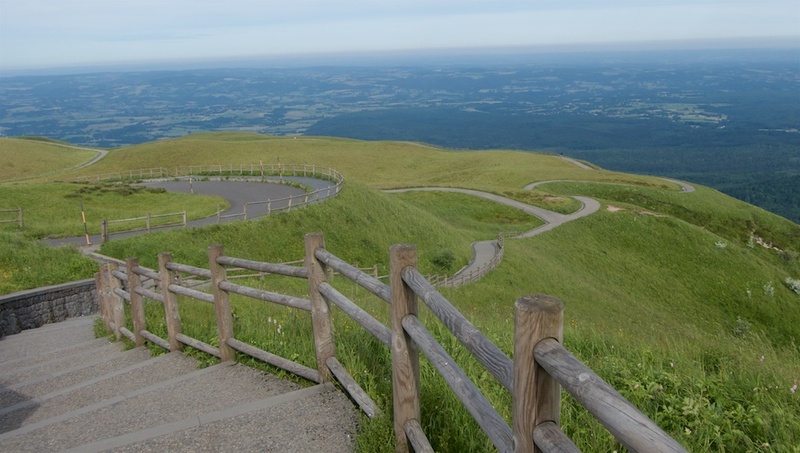 The route basically spirals up to the summit. Final 4.8 kms begins here. Bikes banned. On the way up I could see large parts of the original toll road to the summit that was opened in 1926 – I think now just used by hikers. 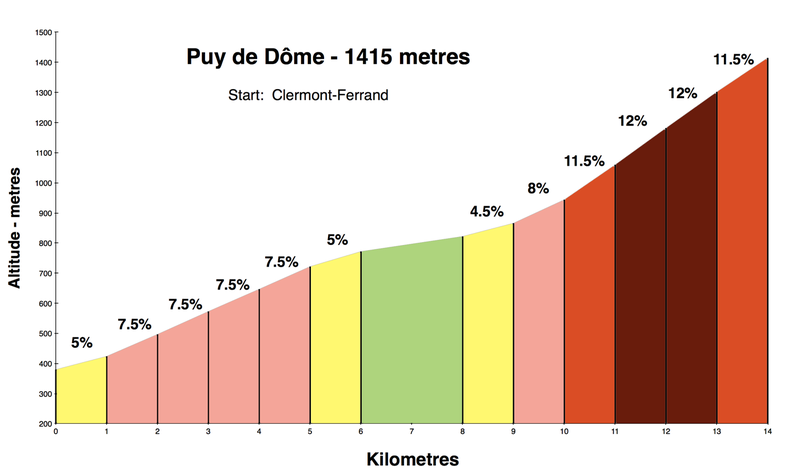 The official finish for the event, and by the Tour de France is at 1415 metres. It’s a plateau with a restaurant, train station, and various other building. But there is a road and some paths that go higher. We were not allowed to descend until 10:30am and I had some time, so I went exploring. 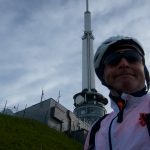 Of course, I rode beyod the finish to the summit (1465 metres). 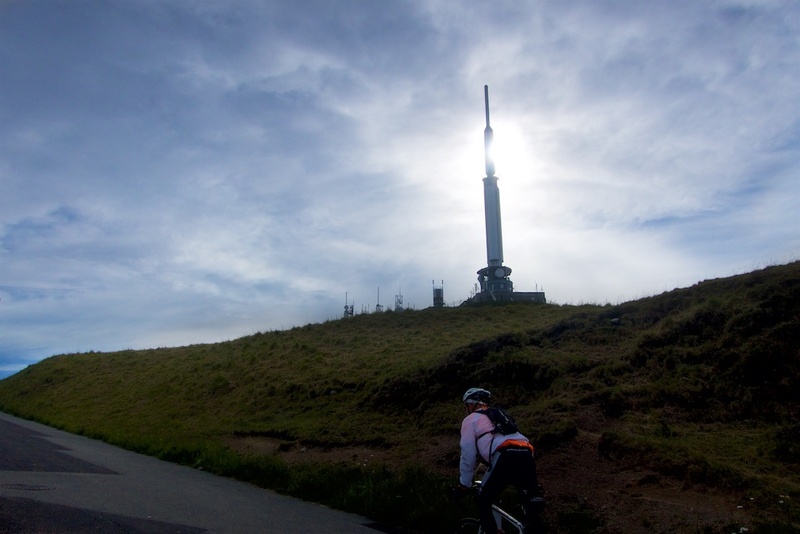 At the very top is a huge Ventoux-like telecommunications tower. above the end of the regular road. 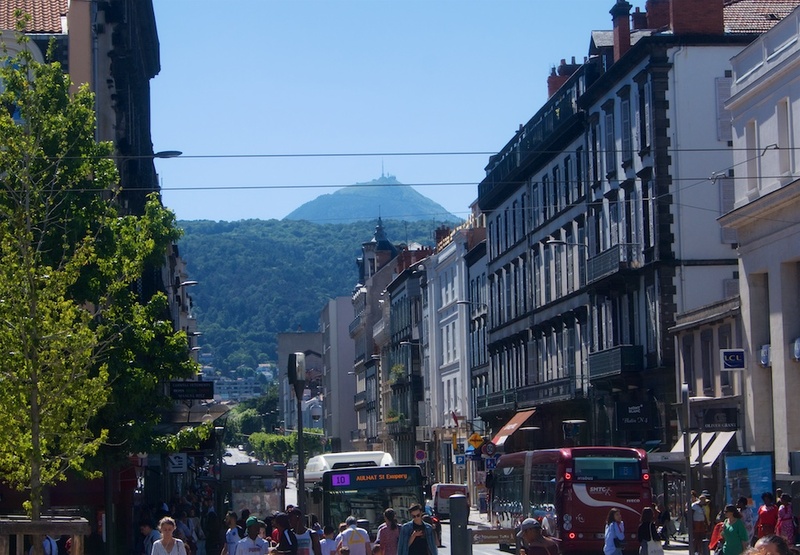 Puy de Dôme is above Clermont-Ferrand (Augustonemetum in Roman times). They are renovating a 2nd century Gallo-Roman Temple de Mercure at the summit. The descent was tightly regulated and we were all asked to descend in a 15 minute window from 10:30am. it was occasionally a little crazy as some people descended the steep, narrow road super fast and others super slow. Me, somewhere in the middle. 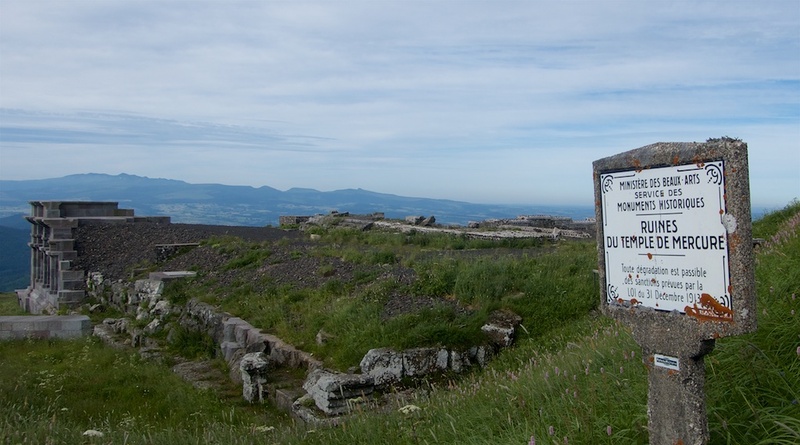 Puy de Dôme is in the Puy-de-Dôme department, the department adds hyphens. 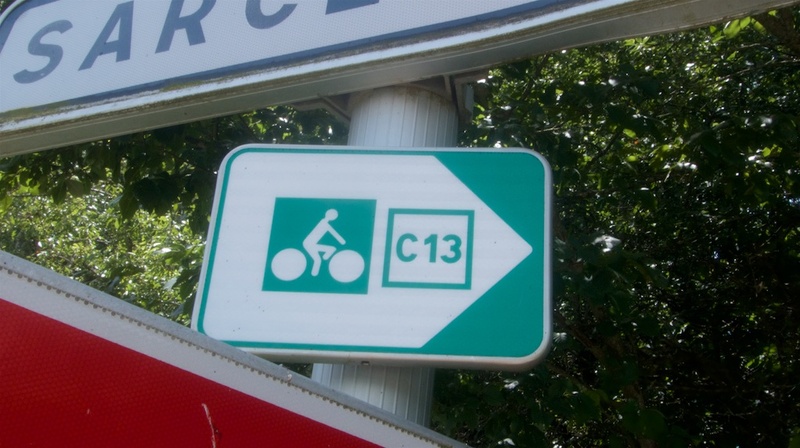 It has an excellent network of signed cycling routes. Tourist offices will give you a map. 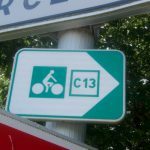 All the signed routes are all also listed online with gpx files available. 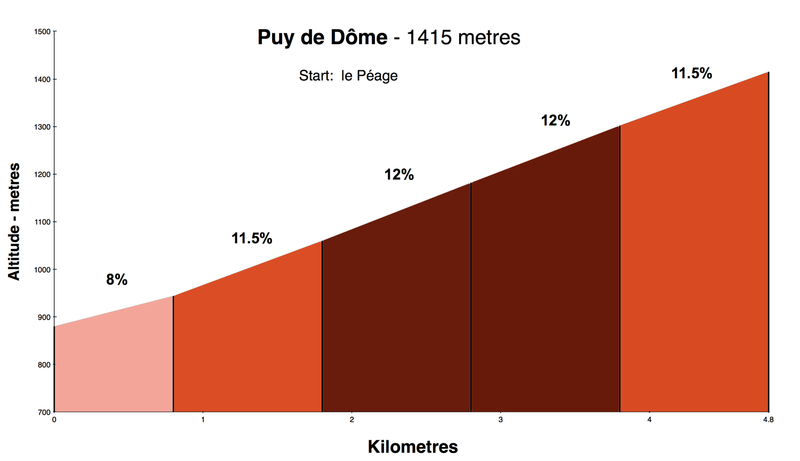 I had downloaded route C13 that passed by the event and I proceeded to do a loop that included two cols (both labelled on the map), and passed a few more volcanoes. 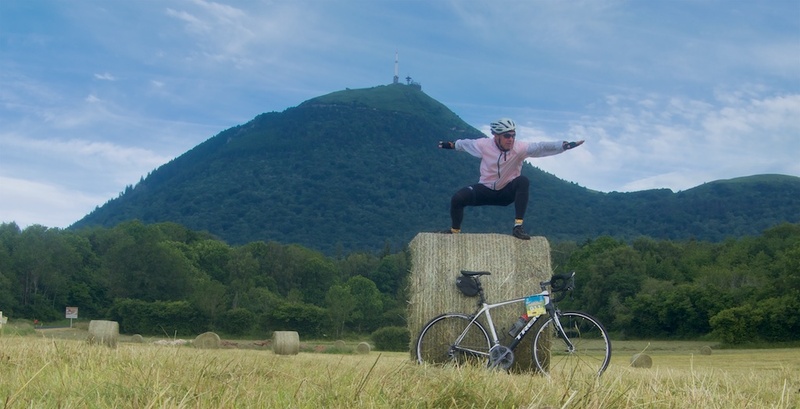 Puy de Dôme in the distance. This was such a fun day. 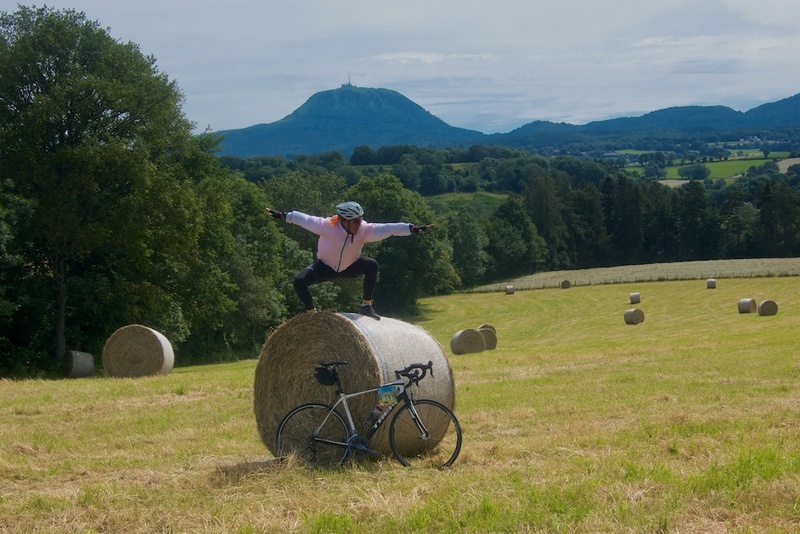 For me, finally cycling Puy de Dôme was a true bucket-list moment. 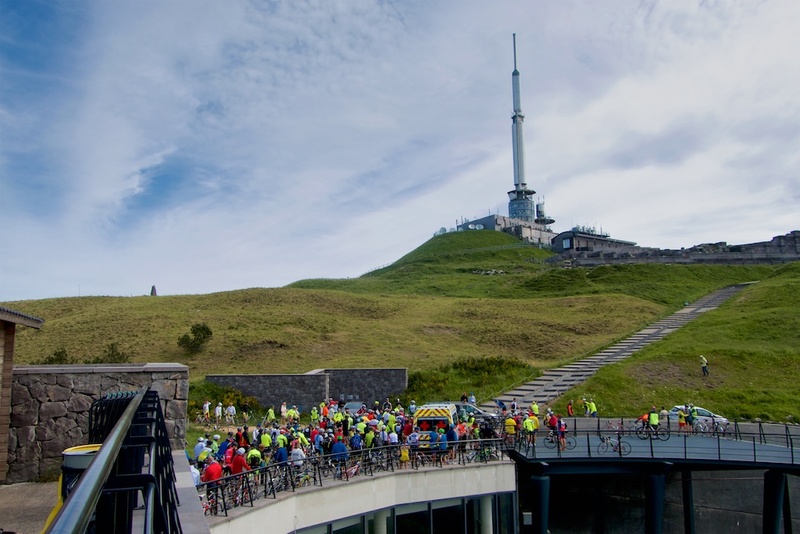 For people wanting to ride up the Puy de Dôme on other days of the year, then the closest you can get is the Col de Ceyssat on the south side of the peak, on the D68. 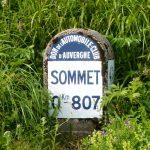 If going from Clermont-Ferrand, I recommend using the D68 that starts in Royat and goes through Fontanas. 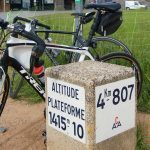 There is a hiking trail up to the peak from the Col de Ceyssat, so bring some shoes to change into and a bike lock and do a bike-and-hike. A lot of people use the hiking trail, so if you want to avoid the crowds then start really early. thx, useful. As I rode by Col de Ceyssat (a weekend afternoon), there were indeed a lot of cars/hikers parked there. Seemed a main “launch” point. When will it be open in 2019? One which side have you found the application? Great article. Hope that I can climb it one day! 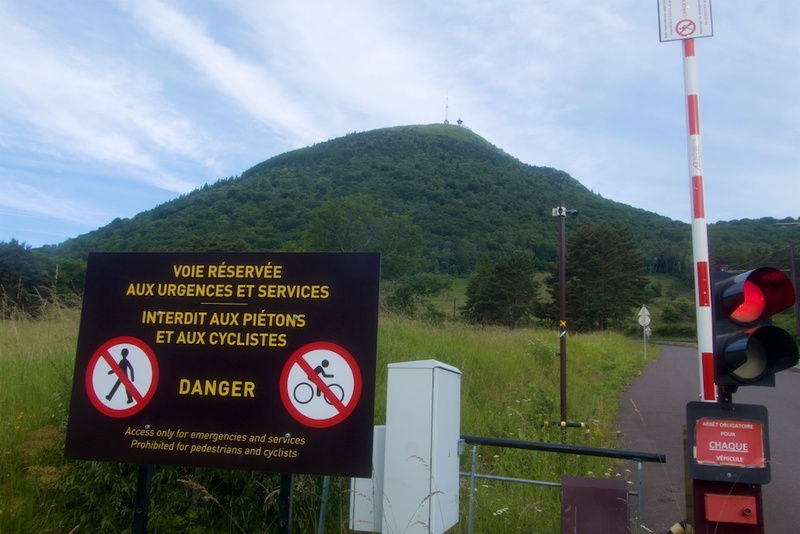 Here’s the web site that had the sign up: http://puy-de-dome.ffct.org/evenements/pdd2018/pdd2018.html . I don’t know when sign up will open but it was something like February in 2018.